ALAMEDA, Calif. – Oakland Raiders TE Jared Cook, C Rodney Hudson and G/T Kelechi Osemelehave been named 2019 Pro Bowl alternates, the NFL announced Tuesday. Cook has been named an alternate after setting career highs in nearly every major statistical category this season, including receptions (63), receiving yards (848) and touchdowns (six), each of which lead the Silver and Black in 2018. Cook has tallied four 100-yard contests on the season, tied for second-most among all tight ends in the NFL en route to the most receiving yards by a Raiders tight end since 1986. Among many of his highlights was his 180-yard Week 1 performance on Monday Night Football. On his record-setting night, Cook set the franchise’s single-game mark by a tight end, surpassing Todd Christensen’s 173 yards in 1986, as it also tied for the sixth-most single-game receiving yardage by a tight end in NFL history. Additionally, his 15 receptions of at least 20 yards ranks third among his position group both this season and in club history with two games yet to play. Also named as alternates to the annual All-Star game at Camping World Stadium in Orlando, Fla., on Jan. 27, 2019, were offensive linemen Hudson and Osemele. Hudson and Osemele, both two-time selections from 2016-17, anchor an offensive line that has assisted in many of QB Derek Carr’s achievements this season. 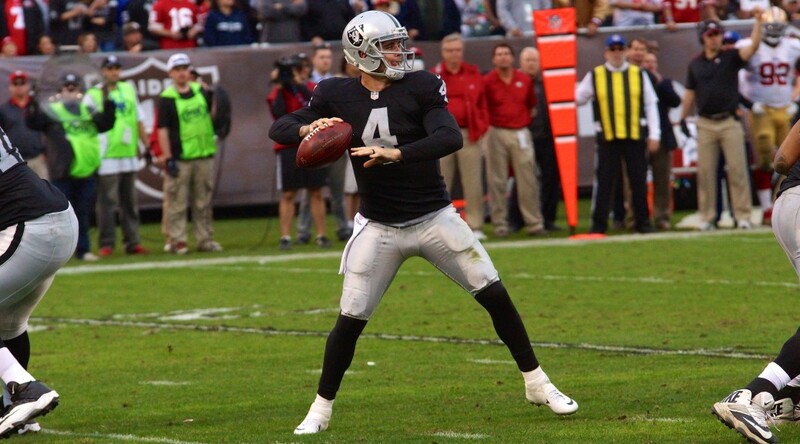 Carr set a franchise record in Week 15 when passing Rich Gannon’s mark of 277 consecutive passes without throwing an interception, and currently stands with the longest active streak in the NFL at 299 attempts. The men in the middle have also provided ample time upfront for Carr this season, as he joined Peyton Manning as the only two quarterbacks in NFL history to complete 300 passes in each of their first five seasons. Per Pro Football Focus, Hudson ranks first among all centers in pass-blocking efficiency, and has not allowed a sack in 914 snaps this season. Since Osemele’s arrival in 2016, the club has surrendered just 90 sacks, a total that ranks as the sixth-fewest in the NFL during that span. NASHVILLE, Tenn. — The Oakland Raiders found a way to pull out a win on a wet, rainy day. Derek Carr threw a 12-yard touchdown pass to Seth Roberts with 1:21 left. 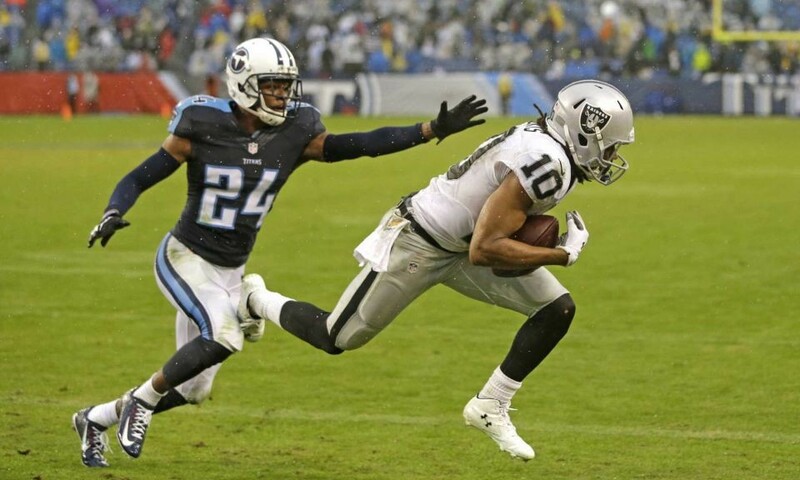 The Raiders stopped a three-game skid by edging the Tennessee Titans 24-21 Sunday. The Raiders (5-6) had a 17-6 lead in the third quarter. In the fourth quarter with just minutes remaining they found themselves behind 17-21. Offensive Coordinator/Play Caller Bill Musgrave went ultra conservative after the 17-6 lead. Almost every Raiders offensive series started with two runs on first and second down followed by a desperate 3rd down pass. Most passes were at or behind the line of scrimmage. Bubble screens were used in back to back drives. The team went 3-and-out multiple times during that stretch. The play calling was confusing seeing that the Raiders only had a 3-point lead for most of the second half. The young cast on offense struggled to get in any rhythm until Musgrave finally took the reigns off Carr on their final offensive drive with a 4-point deficit. To add to the offense stalling out, Derek Carr fumbled the ball on a Center exchange with back up Tony Bergstrom. The Titans took advantage of the short field and scored the go ahead touchdown with 4:13 remaining. The Titans (2-9) lost for the ninth time in 10 games after rallying to take a 21-17 lead. They thought they had a game-saving play when safety Michael Griffin broke up a pass in the end zone on fourth down. But officials flagged B.W. Webb for holding on the other side of the field. Del Rio said rookie Amari Cooper was held. Webb tried to find the official, saying later he never held the receiver. Titans interim coach Mike Mularkey said he had no idea where the flag came from and did not agree with the penalty. Carr said he started yelling instantly about the flag. Two plays later, Carr hit Roberts for the winning touchdown. He finished with 330 yards and three TDs in his sixth 300-yard passing game this season. Nate Allen ended the Titans’ last chance by intercepting rookie Marcus Mariota with 43 seconds left. Mariota took the blame for not looking elsewhere. “I’ll find ways to get better and help our team win some games,” he said. Roberts finished with six catches for 113 yards and two TDs, and Cooper had seven receptions for 115 yards. Khalil Mack had two sacks for the Raiders, who outgained Tennessee 407-249 and held the ball for nearly 35 minutes. The Titans now have lost 11 straight on their home field and are tied for the third-worst home skid. Mariota threw for 218 yards and three TDs, but he was intercepted twice, with the last one coming with no receiver in the area. Oakland’s mistakes helped Tennessee turn a game where the Raiders had been cruising into a frantic finish. The Raiders were flagged 11 times for 94 yards, with two of those penalties keeping Tennessee TD drives alive, and Carr himself set up the Titans’ go-ahead TD by fumbling a snap. Defensive end DaQuan Jones fell on the ball for the Titans, and Mariota threw a 1-yard TD pass to Jalston Fowler to make it 21-17 with 4:41 left. Carr briefly left after taking a shot from Jones on the opening series of the game. But the second-year quarterback returned in time to throw for 187 yards and a touchdown by halftime and Oakland led 10-6 at the break. Carr joined Rich Gannon (10 in 2002) and Carson Palmer (six in 2012) as the only Raiders quarterbacks with six or more 300-yard passing games in a season. … Denico Autry blocked Ryan Succop’s first extra-point try for the first miss by the Titans since 2006 and the first missed extra point in Succop’s career. The Titans kicker had been perfect on his first 205 attempts, including all 18 this season. … Crabtree now has a TD catch in five of his past six games. … Oakland is 4-0 when being flagged for 10 or more penalties. 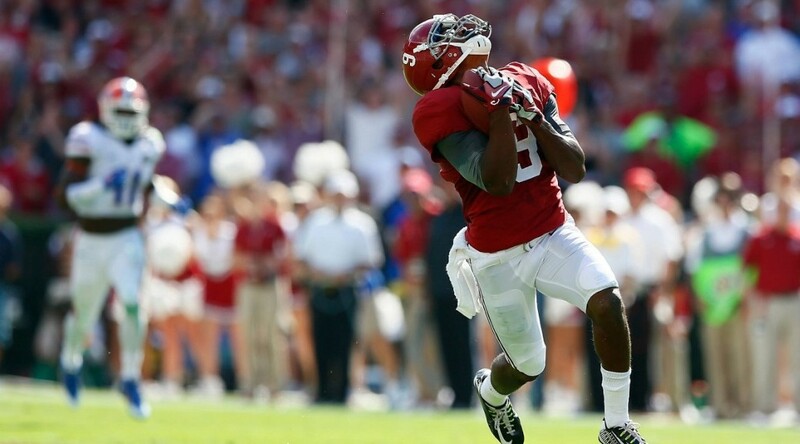 Alameda, California– With the fourth-overall pick in the 2015 NFL Draft, the Oakland Raiders selected WR Amari Cooper (Alabama). The 2014 Fred Biletnikoff Award winner and Hesiman Trophy finalist joins the Silver and Black after a three-year career with the Crimson Tide (2012-14), totaling 228 receptions for 3,463 yards (15.2 avg.) with 31 TDs. Here is some more information on the Raiders’ first-round selection, as well as a closer look at some highlights from Cooper’s illustrious collegiate career. In three years at Alabama, Cooper emerged as one of the nation’s most explosive and polished receivers. Below is a look at his offensive totals at Alabama. He had 228 catches for 3,463 yards and 31 touchdowns in three seasons. That includes a standout junior season where he had an NCAA best 1,724 receiving yards. “The repetitions that he’s had playing the position, running the route tree and doing all the things that he’s done to develop himself, makes him a guy that has that label of being polished,” Del Rio said. “That’s why. He’s earned it. Jack Del Rio answers a question about if you ink Amari Cooper in as a starter from day one. “Cooper was high on our board from the start,” general manager Reggie McKenzie said. “Honestly, it didn’t matter about the position. It was about the player. We thought we had a chance to get a really good player. 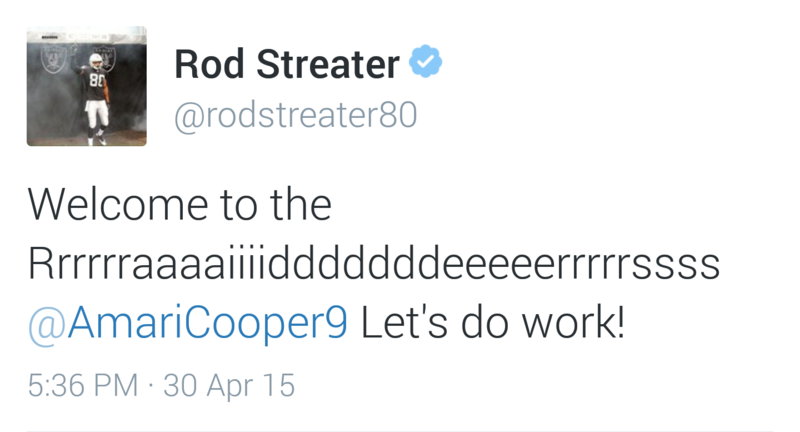 Raiders only meeting with Amari Cooper was at the combine. They didn’t bring him in for a workout. 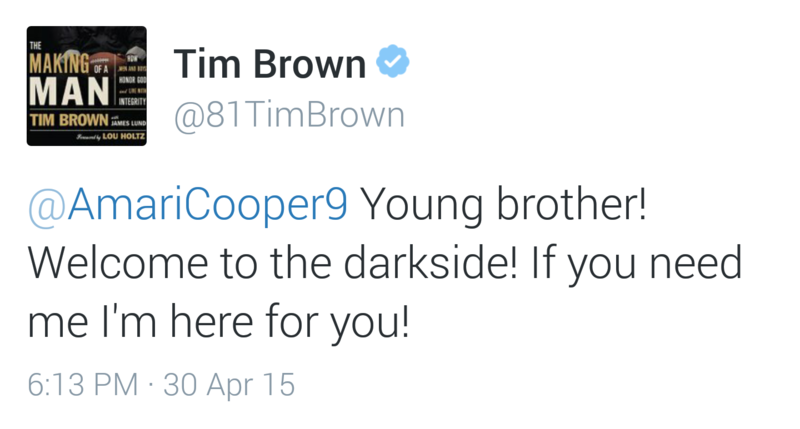 They learned about Cooper by talking to people around the Wide Receiver. They also had some inside knowledge of the player. Linebackers coach Sal Suneri’s son Vinny was a defensive at Alabama with Cooper from 2012-13. He’s a character player supremely focused on football, but McKenzie also lauded Cooper’s on-field ability, which the Raiders have studied for some time. Q: Considering the Raiders weren’t one of the teams that brought you in for a visit, how shocked were you to hear your name called when they were on the clock? Q: How did you get that feeling that they liked you? Q: You were targeted 170-something times last year. As an NFL rookie, you might not be targeted that many times. Is that going to be frustrating for you? Q: People talk about how polished you are. What are some of the things that you think you still need to work on most? 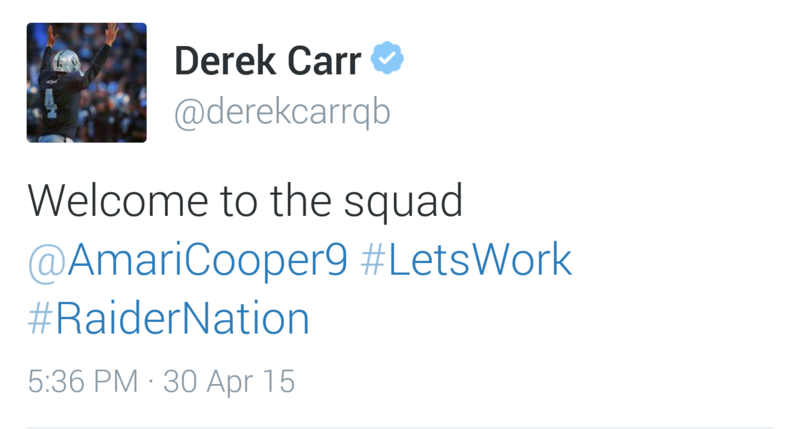 Q: Do you know anything about Derek Carr? Q: How much did Lane Kiffin help you to develop to the player you are? Q: How did you develop your approach? Where did that come from? Q: How young were you when you started playing wide receiver? Q: How did you choose to play wide receiver in the third grade? Q: One thing that you are better at than most prospects is your route-running. How much of that have you focused on? Q: Did you watch any specific wide receiver on film to pattern yourself after? Q: What’s your experience level with California and the Bay Area? Q: So, in fourth or fifth grade, you’re in your backyard running routes? Q: So you’d just run the routes and they’d throw to you? Q: Would you say it was perfecting your route running that led to your breakout season last year? Q: What drew you to football as a kid?